After delivery in March, the 34-metre Curvelle Quaranta will charter in the Western Med, it has been announced. 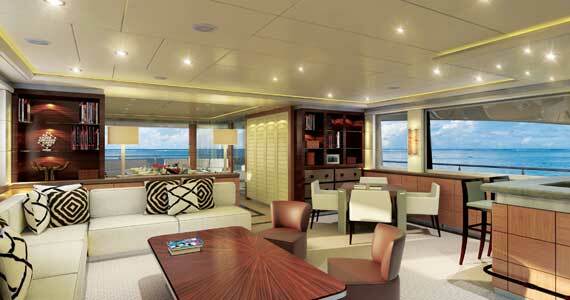 Although on the smaller side of superyachts, it has four decks and, say the brokers, offers approximately 50% more accomodation space than on a yacht of a similar size. Layout flexibility is key on this yacht, as cabins are quickly changeable into three suites, six cabins or a combination. An area sure to be popular is the main aft deck, which features a lifting platform and beach club area that lowers the guests and the tender straight from the main deck into the water for swimming and watersports. The yacht will charter for €145,000pw in high season and €125,000pw in low season through Hill Robinson.